Vancouver’s Grouse Grind climb is something of an initiation for those new to the city. When Thom met his now colleagues they asked him if he’s taken on the Grouse Grind yet. We hadn’t by that point but made sure to take on the climb to the top of Grouse Mountain the following weekend. 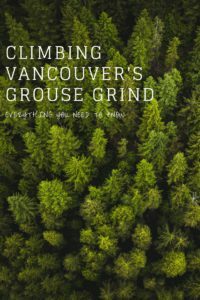 If you’re new to Vancouver and have heard people talking about the Grouse Grind but aren’t sure what it is, or you fancy getting active on your holiday to Vancouver, then here’s everything you need to know about climbing Vancouver’s Grouse Grind. 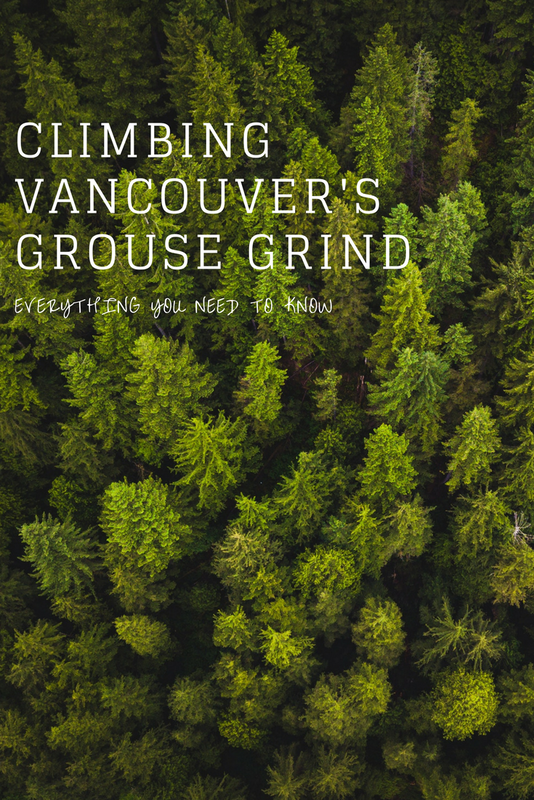 What is the Grouse Grind? Who would you recommended the Grouse Grind to? What do I need for the Grouse Grind? 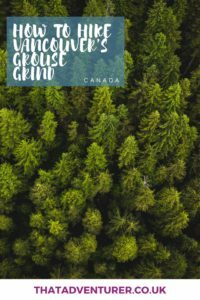 When can I do the Grouse Grind? How long does it take to complete the Grouse Grind? What’s the fastest time for completing the Grouse Grind? How do I get to the Grouse Grind trail? The Grouse Grind is a challenging climb that takes you up to the top of Grouse Mountain. To get the top you face a rather steep 2.9 kilometre climb that’s often referred to as “Mother Nature’s Stair master”. It’s a very good work out for the legs! If you’re in Vancouver, or have visited before, Grouse Mountain is the one to the north of the city with the big wind turbine on top of it. You get incredible views on a clear day all the way out to Washington State and there’s also plenty to do at the top of Grouse Mountain once you’ve recovered from the Grouse Grind! Each year, more than 150,000 people hike the Grouse Grind. So don’t expect to ever get the trail to yourself! 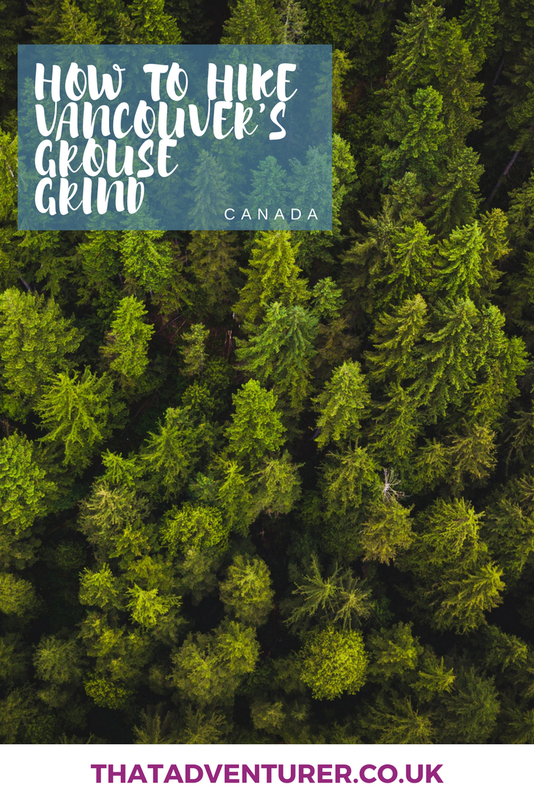 Whilst it is very challenging and will tire you out, on any given day you will see people of all athletic abilities take on the Grouse Grind. We saw children, trail runners and very casually dressed walkers climbing up when we took on the challenge. You’ll have more fun if you’re used to steeper climbs, but you’ll get a big sense of achievement either way! You’ll need some good shoes. Trainers are good enough – hiking boots are probably a bit much. Some comfortable clothing and a full water bottle! You may want some snacks too for a half-way pit stop! As there’s nowhere to fill your bottle up on the trail make sure you have plenty of water. The Starbucks by the gondola will fill it up for you and there are water fountains at the top of the mountain to refuel! The Grouse Grind is really only a spring – autumn hike. 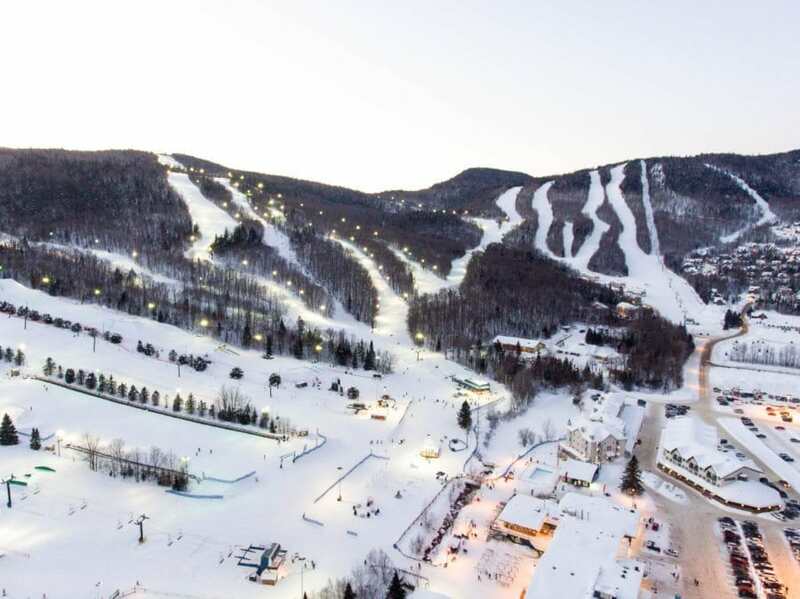 The mountain gets too snowy and icy to make it safe or recommendable. 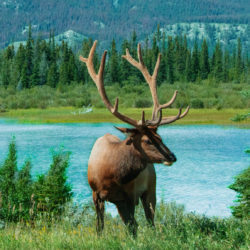 During spring – autumn the trail is officially opens at dawn and closes at dusk (7pm at the peak of summer). We finished the Grouse Grind in 55 minutes. The official Grouse Grind website states that the average climber takes up to 1 and a half hours to complete the trail. If you’re new to hiking then give yourself two hours. The official course record for men is 25:01 and has been held since the 2010 BMO Grouse Grind Mountain Run which happens annually in September. The women’s record is 30.52 which was achieved in 2014. There are also unofficial records where the time is recorded outside of the annual competition. The same man who holds the official record also holds the unofficial record of 23:48. The trail for Grouse Grind is just to the east of the cable car entrance. As you leave the parking lot it’ll be on your right. You’ll probably see a few people disappearing off into the forest or others limbering up before they take on The Grind! Getting to the start of the Grouse Grind trail is easy from Vancouver and Vancouver’s North Shore. 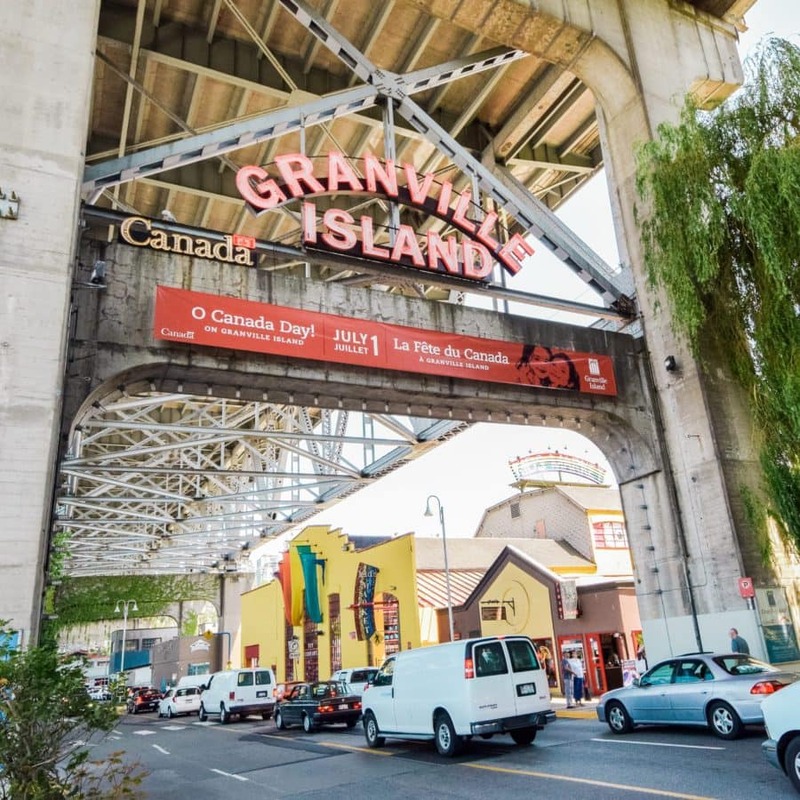 Head out of down town through Stanley Park and over Lion’s Gate Bridge and follow signs to Grouse Mountain. At the bottom of Grouse Mountain there’s a car park (which gets pretty full!). You can park for 3 hours for $6 or all-day for $8. 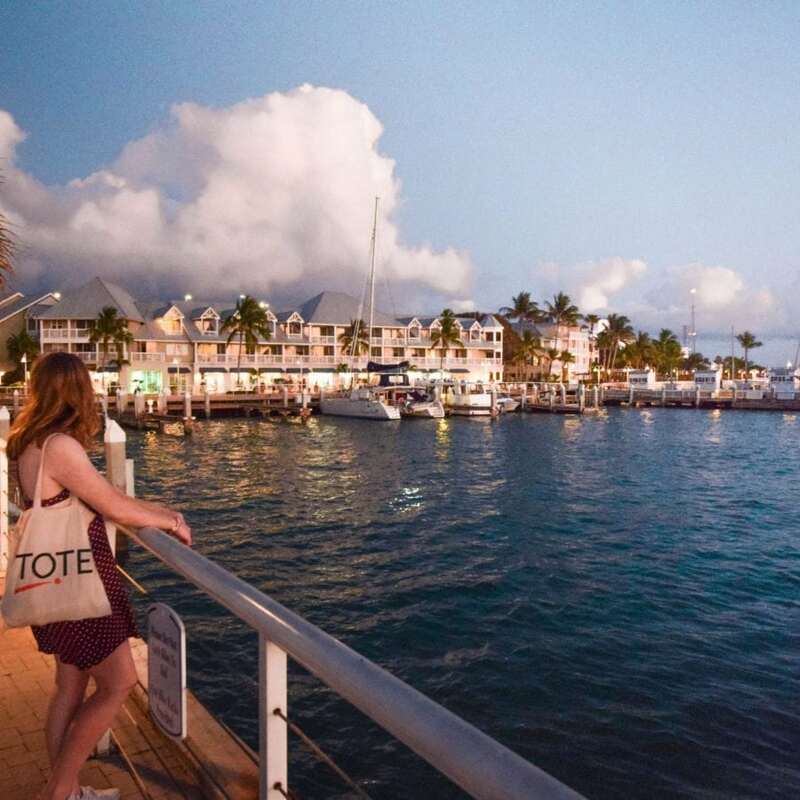 Locals can also buy an all-year parking pass. You an also take a free shuttle bus to the start of the Grouse Grind. 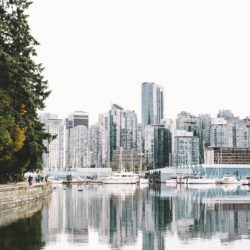 The bus leaves from Canada Place every 20 minutes in July – August and every 30 minutes in May, June and September. The Grouse Grind is really only for going up since it’s pretty narrow and there are already a lot of people on it. To get down Grouse Mountain you should purchase a ticket for the gondola which costs $10. Expect to queue for the Gondola back down although the queue does move pretty quickly. Of course, you could also just get the gondola up and down if you don’t fancy tackling the Grouse Grind! There are markers for each quarter of the trail to let you know how you’re doing. The first quarter seems the longest but it is the least steep. So there’s that. The second and third quarters of the trail are the steepest and the last one is (almost) a piece of cake once you know you’re almost there and you can see the light through the trees!